It's true that 2018 was the year of fashion fads (we're looking at you, ugly shoes and naked dresses), but there are certain styles that over the years have managed to operate separately from the melee of the mainstream. Minimalism is one of those trends. Broad-sweeping and multifaceted, minimalism is an aesthetic that can be applied to everything from fine art and music to interior design, and, of course, fashion. There are certain moments in fashion history that can be perceived as minimalist, whether it's Coco Chanel's sporty separates or Calvin Klein's '90s greyscale colour palette. But in general, minimalism has pottered along, occasionally making its presence felt but mostly keeping to itself. However, it seems as though 2019 is ushering in yet another minimalist revival. 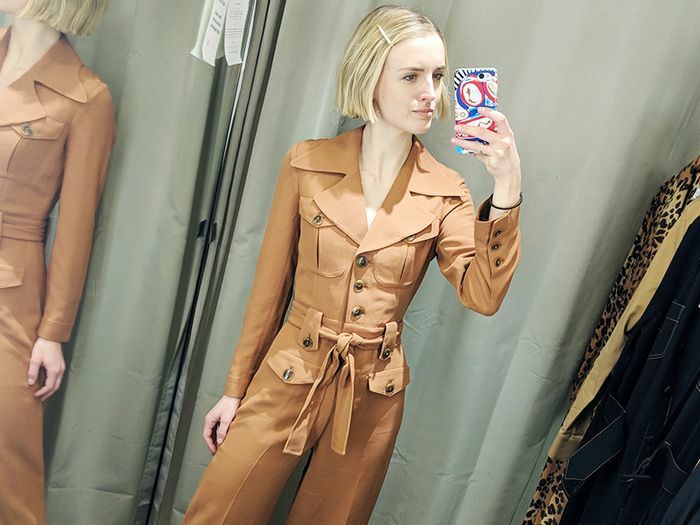 If you look at the street style trends from fashion week, you'll notice that many influencers have forgone their usual peacocking pieces and instead opted for muted tones and pared-back silhouettes. We've lost count of the number of times we've spotted an austere, head-to-toe beige ensemble. So what does this year's iteration of minimalism look like? To answer these questions, I decided to visit three high-street stores that are renowned for their minimalistic design credentials: COS, Arket and Weekday. All Scandi, they perhaps unsurprisingly embrace a clean-lined aesthetic, yet each one offers a different approach to minimalist style. This is what I learnt: COS should be your go-to for dramatic cuts and trend-led, colour-blocking separates. Arket, meanwhile, is great for layering pieces and luxe basics, such as tailored trousers and expensive-looking knitwear. Weekday, on the other hand, has a more utilitarian spirit, with unisex staples and plenty of non-stretch denim. So what is the key to creating a successful minimalistic outfit now? In my opinion, it lies embracing contrasting textures to compensate for the lack of prints, creating unexpected colour pairings and balancing fitted pieces with oversized silhouettes. The saying "less is more" has never felt so relevant. Scroll down to see my favourite minimalistic pieces from COS, Arket and Weekday. Style Notes: While most minimalistic pieces eschew prints, checks can offer a great middle-ground. 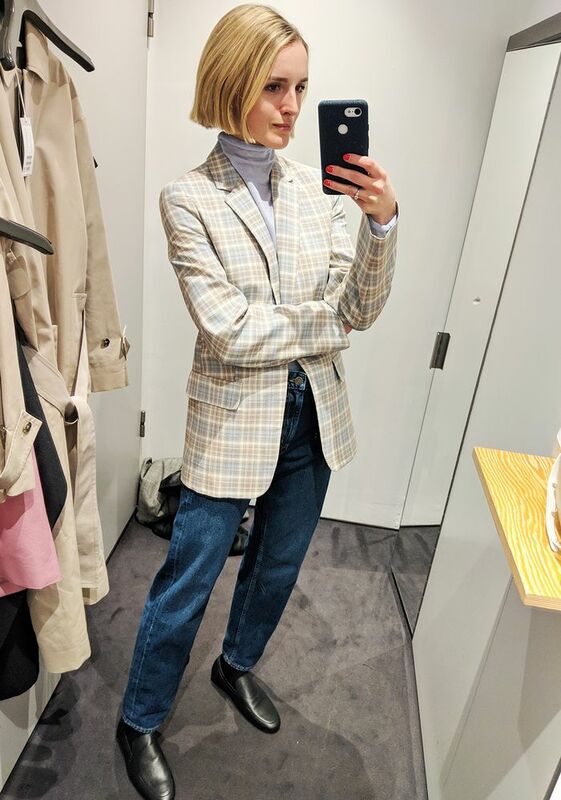 This checked COS jacket has a boxy and slightly oversized fit, which looks fab with jeans and a roll-neck. Just take note that COS jeans come up large, so make sure to size down. Style Notes: It's surprisingly hard to create interesting looks out of just a few simple pieces, but I found that layering was my saving grace in this regard. Case in point? Arket's mint-coloured midi dress is elevated to new heights when thrown over a pair of wide-leg linen trousers. Style Notes: I am not usually a hoodie person, but I was inspired by an editor I saw at London Fashion Week who layered a hoodie under a tailored blazer. This Weekday coat was the ideal outer layer, as it was seriously roomy (I'm wearing a small) and the beige hue harmonised well with the lilac. Style Notes: Now this is what COS excels at: well-cut, trend-led tailoring. The brown hue might not be for everyone, but I like the fact that it offers a more fashion-forward alternative to a classic black suit. It would look so cool with a white tee and sneakers. Style Notes: A pair of wide-leg trousers and a skinny roll-neck is one of my favourite outfit pairings. As you can see, this Arket knit is pretty sheer, but I was drawn to the lilac hue (set to be big this summer) and the tight fit, which looked flattering when tucked into the high-waisted trousers. The lilac iteration isn't currently available online, but I've put an alternative below. Style Notes: This outfit is minimalist heaven. Weekday's pale yellow (another 2019 colour to watch) boxy jacket was made to be worn with straight-leg white jeans for spring, while a Breton top keeps the pairing from becoming too washed-out. Style Notes: I find that most minimalist-style dresses can pretty quite boxy, but I liked this simple silky Arket cami dress, which is fitted at the waist and layers nicely over a skinny roll-neck. Style Notes: With its black hue and sculptural cut, this dress is a quintessential COS. It wouldn't be something I would usually pick up, but I quite enjoyed the dramatic wrap-effect skirt and long sleeves. I would wear with leather mules and hoop earrings as a minimalistic alternative to bohemian style this summer. Style Notes: Yes, minimalists can wear colour, too. This orange knit from Arket has everything I want from a jumper: a chunky crew neckline, button detailing and just the right level of slouch. It would go with everything from tailored trousers to floaty slip skirts. Style Notes: Bomber jackets aren't my usual style, but the great thing about this Arket jacket is that you can incorporate it into your outfit without losing any polish. Its boxier fit means it looks great tailored black trousers and roll-neck, plus it's super warm. Style Notes: Pastel pink might feel like an extroverted hue, but when combined with an unadorned cotton coat, it feels very chic. It's the ideal way to elevate beiges and browns, or just your favourite pair of jeans. Style Notes: One of the potential downsides to COS is that it very much caters to tall girls. Case in point? This asymmetric knitted dress comes down to my ankles, which isn't so ideal if you're under 5'7". However, if you are taller and struggle to find things that fit, this dress is for you. I would just say order a size down, as it comes up fairly roomy (I'm wearing a small and usually wear a size 8 dress).